Suffolk residents are being praised by St John Ambulance, after a used cooking oil collection campaign across the county saw £550 raised for the charity. 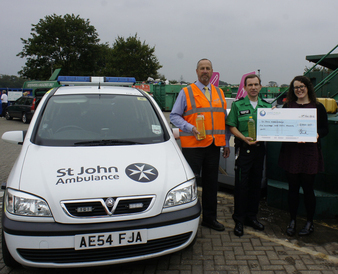 The campaign, spearheaded by Suffolk County Council in partnership with FCC Environment and eco-firm Living Fuels, saw a ten pence donation made to St John Ambulance for each litre of used cooking oil collected at the county’s eleven household waste and recycling centres between July and the end of September. All of the money raised from the initiative will go to providing direct care to people in the local community and ensuring that first aid is available to local people. Councillor Richard Smith, Suffolk County Council’s cabinet member for economic development, environment and planning said: “I am delighted that this campaign has been so strongly supported by local people across the county. I hope that people will continue to bring their used cooking oil to their local Household Waste Recycling Centre, helping to provide green electricity to the National Grid." Once collected, Living Fuels recovers the used cooking oil naturally into an environmentally friendly bioliquid using a totally natural settling and filtering process. The recovered cooking oil is then used in the company’s power facility in Suffolk to provide electricity to the National Grid at times of unexpected power demand. All sites will continue to accept waste cooking oil.